This rough game sketch follows some ideas laid down in the latest Fictoplasm podcast about Pale Fire by Vladimir Nabokov. In summary, a lot like a contemporary game, a liminal fantasy, magical realism, a setting that looks like the real world but with weirdness. The characters are exiles from “Ruritania”, a.k.a. The Old Country. This is a place that (mostly) exists outside the game area. Most of the time the characters have settled in a “Ruritanian colony” in The New Country. This colony isn’t really a real place, but it’s close enough to all the real places in the New Country that most non-Ruritanians, or “normal people” could not tell the difference. It fits right in with their world, they can easily travel to it, etc. What do the PCs do in this place? Well, any kind of modern drama/investigative type of game. The world looks like our world, and the people inside it behave accordingly, and most of the time you follow the characters around and see how their lives link up. But at some point, Ruritania intrudes on the real world. Ruritania is the exotic, the weird, the magical. It’s also subjective; Ruritania means different things to different characters. And it’s possible to hold a personal view of Ruritania and experience someone else’s version. Ruritania is a single place but viewed from many different perspectives. The default setup is that assassins from Ruritania are stalking the characters. The game should play out episodically like a drama, soap opera, police procedural, etc. with a weekly (well, short) story arc. But the Ruritanian arc is long-term. As things get stranger, the assassins get closer to where the PCs are; and when they are close enough, they strike. 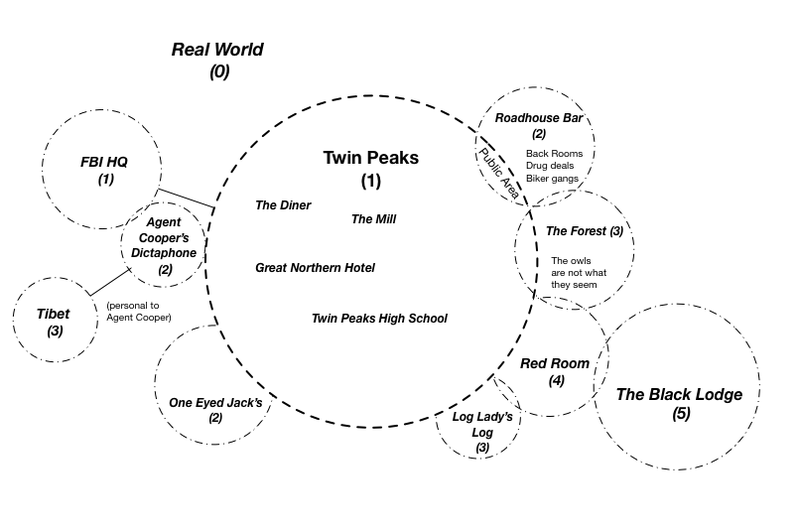 The goal is to run a game like Twin Peaks with “real” people and their personal interests and drama. Most of the time things are perfectly mundane but at points the strangeness intrudes. Dramasystem should work very well for setting up the web of relationships. Where Dramasystem fails for procedural bits, consider the procedural approach in Malandros. Also consider the WaRP system, which works nicely for very light characters. WaRP is very neat looking with the Central Trait, Side Traits and Negative Trait. Consider the involvement of NPCs in Dramatic and Procedural scenes. A lot of Dramasystem supposedly focuses inward; but a game like this needs external characters to come from outside and connect with the interior characters. 5 is full-on Ruritania; the magical or weird reality that is stalking the characters. Locations in the game world can have ratings that go up and down. These ratings represent difficulties for passing into certain areas. See the Boundaries bit, next. During the game, each character will have a clock which goes up or down. As their rating increases they become more sensitive, more connected with the secret world (criminal underworld, psychic world, dream world, etc.). If this is handled using an Apocalypse World style of “hard moves” then above a certain threshold on the clock certain options are opened to the GM to take hard moves on behalf of the Ruritanian assassins, representing their progress towards the characters. Additionally when the characters are “in Ruritania” (i.e. in the psychic landscape) they may have restricted actions depending on what permission they have to be there — this fits with e.g. a dream world where certain moves simply aren’t available owing to dream logic. “Ruritania” represents somewhere far away, magical, normally separate from reality; a higher world, a dream world, an idealised state, a place yearned for. It’s the Black and White Lodges in Twin Peaks, the higher universe of Yesod in the Book of the New Sun, the dream worlds of Dreamscape or Nightmare on Elm St, and so on. Ruritania in the game is an unattainable state — and it’s normally a place the characters are fleeing from, and from whence they are pursued with lethal intent. But there are Ruritanian colonies for the exiles; decide whether these are created consciously or happen spontaneously. Maybe they are necessary for survival; the Ruritanians can sustain themselves for a short while in the real world as vampires by feeding off individual dreamers, but for long term health they need to be in a place of stability. Maybe Ruritanian exiles gathering together in one place is a risky strategy since it attracts attention, but they’re forced to get together to survive. What happens when normal people who are touched by Ruritanian unreality leave? Are they haunted? Are they infected? Is Ruritania a transmissible condition? Partition the areas in the map with clear boundaries, and rank these areas according to the previous scale: 0 for real world, 1 for not-quite-there, 2 for magical realism, etc. Consider that some of these areas can be reached normally, but the magical or secret or mysterious part can only be accessed with certain permissions. Draw these as circles with cross the main boundary. If you were playing Twin Peaks most characters would be drawn together by Laura Palmer’s murder. Agent Cooper travels in from outside but the other characters are already in the location. The law enforcement characters and indeed everyone affected by Laura Palmer’s death will be interested in getting answers. This would be the arc plot; over the course of the game the Assassin will draw closer and the Black Lodge exert more of an influence. But there should be episodic drama too, and that’s what the characters should be doing week on week. Dramasystem offers a nice structure to let players frame scenes so they each get spotlight. Consider the balance of incentives in pursuing individual dramatic poles vs. the arc plot. Agent Cooper’s actions are restricted in the Red Room, and early on he’s only allowed to be a spectator and only to receive cryptic information. He only accesses the room in dreams. All of these point to the level of permission he has to act freely in the Red Room (and the Black Lodge), and (in game terms) the moves he can make in that environment. Furthermore the advent of his dreams is a result of ramping up of weirdness and the psychic world penetrating the real world when he’s in Twin Peaks.